Wine sales are currently sky rocketing, and where and how we choose to consume wine is changing. Many people prefer to drink their wine at home rather than at the bar/restaurant. Moreover, the consumption of wine has turned into a daily routine best enjoyed at home with dinner. It may sound awkward for your non-wine consuming friends, but if drinking wine at home is your style, then you need to get serious and buy a wine refrigerator. Besides, keeping your favorite wine in a hidden cupboard somewhere doesn't cut it -- you need to enjoy your wine in style. Do you want to store your wine fridge in the kitchen or the living room? It is advisable to purchase a small refrigerator that uses thermoelectric cooling rather than the standard compressor. Thermoelectric wine coolers (EPA) are very quiet, energy efficient, dependable, and it does not vibrate, thus enabling you to enjoy your house comfort without additional noise. Also, make sure you place your refrigerator in a location where it can access fresh air to maintain the temperature and humidity fluctuations to a minimum. The cost of wine coolers rose, as new conditions set by EPA in 2016 required wine coolers to test the wine refrigerators for energy efficiency. Ordinary refrigerators are meant to keep out moisture while wine refrigerators are supposed to keep it. Humidity helps to keep wine bottles corks wet thus slowing the aging process. Also, wine coolers have specific wine bottle racks, unlike normal household refrigerators. 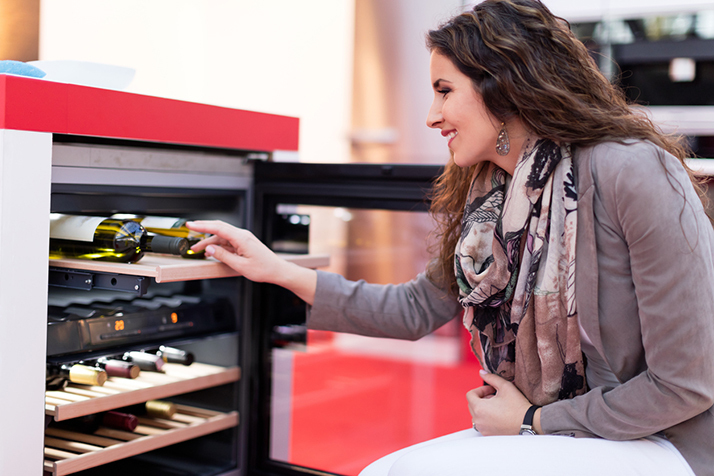 Make sure the wine fridge looks great as well as its functionality. The wine refrigerator should match your house styling like color, and size. It is important to consider the door designs. Some wine fridges have a solid door that protects your wine against harmful UV rays. The solid refrigerator doors are either steel, wood finish, or tempered glass doors. Tempered glass doors allow you to show off your wine collection as well as adding beauty to your home. If you're interested in a wine refrigerator, visit our store today!